Every time I hear the name The Flatlanders it is preceeded by The Legendary, so I just assumed that I had missed a raft of their albums the first time around. 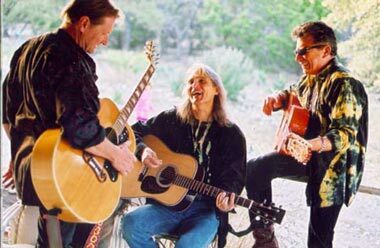 The fact that Jimmie Dale Gilmore, Joe Ely and Butch Hancock only played together under that name for a few years before pursuing solo careers comes as quite a surprise. During their time together they only produced one exceptional but commercially stillborn album. (It was re-released in 1990 by Rounder Records under the title More A Legend Than A Band.) They have remained kindred spirits over the years and have helped create and define that special blend of music created by Texas singer-songwriters. The big skies and deadly heat combine with rock & roll, cowboy poetry and Tex-Mex culture to create roadhouse friendly music. This languorous and funky sound comes to the band as easily as sweating. Lyrically, they often dwell where the earth meets the sky.